Neil Leslie Diamond was born January 24, 1941 to Rose and Akeeba Diamond in Brooklyn, New York. Four years later, the Diamond family, which now included Neil's younger brother Harvey, moved to Cheyenne, Wyoming where his father was stationed with the United States Army. While Neil was in highschool, they moved back to Brooklyn’s Brighton Beach. Neil recieved a guitar for his sixteenth birthday, a gift would change his life forever. From that point on Neil focused on music lessons and later, songwriting. As a teenager, Neil wrote his first song for his girlfriend. It was called "Hear Them Bells," and although he never thought about recording it at the time, he did record it many years later. At age 18, Neil composed a tune called "Blue Destiny" and he was sure it was going to be a hit record, but it would take 8 more years before that moment came. In 1962 Neil signed with Columbia Records and recorded a song called "At Night," which did not sell. He later attended NYU as a pre-med student on a fencing scholarship, but songwriting remained his first love. He left college six months before graduating to accept a songwriter's position with a publishing company for $50 a week. Diamond eventually leased an office on Broadway where he could devote all his time to writing. His first taste of success came when Jay and the Americans recorded his tune, "Sunday and Me". After several lean years, he was approached by producers Jeff Barry and Ellie Greenwich, a meeting which led to his eventual signing with Bang Records. At his first session in 1966, Neil recorded what would become his first hit single, "Cherry, Cherry." It rose to number 6 on the Billboard charts and it was soon followed by two more chart makers, "Girl, You'll Be a Woman Soon" and "Solitary Man". Diamond's reputation as a songwriter was enhanced when The Monkees recorded his tune, "I'm a Believer", which topped Billboard's charts for weeks. His own recordings struggled; his 1967 release of a country tune, "Red, Red Wine", was a disappointment and wouldn't be successful until 1988 when a band called 'UB40' recorded it in a reggae style. Bang Records was growing restless over Neil's failure to place more songs on the hit parade, and when they balked at releasing a single called "Shilo," Diamond decided to move on. He signed with UNI records in 1968, and "Shilo" soon placed in the top 40. From there, Diamond started a long string of hit records that saw him hit the charts with "Sweet Caroline", a song that went to #4 across the nation and is still a staple today. "Holly Holy" soon followed, reaching #6 and "Brother Love's Traveling Salvation Show", which became a highlight of Neil's live shows. Diamond's first number one record as a performer came in 1972 with "Cracklin' Rosie". He followed this with another #1, "Song Sung Blue" as well as "I Am...I Said". It was during this period that Neil recorded what would be a classic album for its time, "Hot August Night" which was recorded live at The Greek Theatre. Diamond's reputation as a charismatic performer grew steadily in the 70s. In 1972, the Schubert Organization presented him in concert for a record-setting 20 performances of a one-man show at the Winter Garden Theater, making Neil the first rock-era superstar to headline on Broadway. At the height of his touring popularity, Diamond announced a sabbatical from the stage to devote more time to his family, but he soon resumed performing with record breaking tours of Australia and New Zealand. In 1973, Neil signed with Columbia Records, with which he enjoyed his greatest successes. His first release for the label, "Jonathan Livingston Seagull", became his #2 all-time best-seller and earned him Grammy and Golden Globe awards. In 1974 he released "Serenade", which yielded the hit, "Longfellow Serenade." In 1976 he recorded the platinum selling album, "Beautiful Noise", with producer and former member of "The Band", Robbie Robertson. The late 70s found Diamond on both the radio and TV airwaves. In 1976, he returned to the Greek Theater for eight sold out shows, resulting in his first TV special and his second live LP, 1977's platinum "Love At The Greek". In early 1978, Neil was asked to write the theme song for a TV sit-com. When the show was rejected by the networks, he decided to keep the song for an upcoming album. Months later, a disc jockey brought a home made recording to Neil's attention. A radio station engineer had spliced together Neil's version of his album cut, "You Don't Bring Me Flowers" with a Barbra Streisand rendition of the same song. It was getting such good response, that the station had added it to their playlist. Neil decided to re-record the song with Streisand herself, and within weeks of its release, the single went to number one in the U.S.
Neil followed with "I'm Glad You're Here With Me Tonight", and "September Morn", to continue his streak of RIAA-certified platinum albums. In 1980, Diamond not only starred in the remake of the movie classic "The Jazz Singer," but he composed and performed the film's multi-platinum soundtrack album, which included the hits "Love On The Rocks'", "America," and "Hello Again." The title track to his 1982 album "Heartlight" was another monster hit, and in 1986 he followed his smash 1972 live double album, "Hot August Night" with "Hot August Night II". The 90s served to further Diamond's standing as one of his generation's premier performers. A Christmas album spawned "Neil Diamond's Christmas Special," which premiered on HBO in 1992 and aired on ABC-TV the following year. According to Amusement Business, he was the top concert draw in the U.S. for the first six months of 1992. A second holiday set, "The Christmas Album Vol II", was issued in 1994 and duplicated the success of the first volume. In 1993, meanwhile, Diamond returned to his roots with the album "Up On The Roof -- Songs From The Brill Building". Featuring 16 of Diamond's favourite pop songs from the 50s and 60s, the disc showcased classics by such top songwriting teams as Goffin & King, Mann & Weill, Leiber & Stoller, and Bacharach & David -- all of whom were closely identified with the Brill Building, the renowned songwriters and publishers headquarters located on Broadway in Midtown Manhattan. Also in 1996 came the extraordinary 70-song "In My Lifetime" boxed-set containing 37 hit singles, 16 previously un-issued early demos, alternative versions of well known classics, the newly written and recorded title track, and a full-color 72-page booklet with extensive liner notes including an interview with Diamond, scores of rare photos, a complete discography, and song-by-song annotations by Diamond. It was a fitting package for the enduring artist who had already sold 110 million records and set box office records at major venues all over the world. 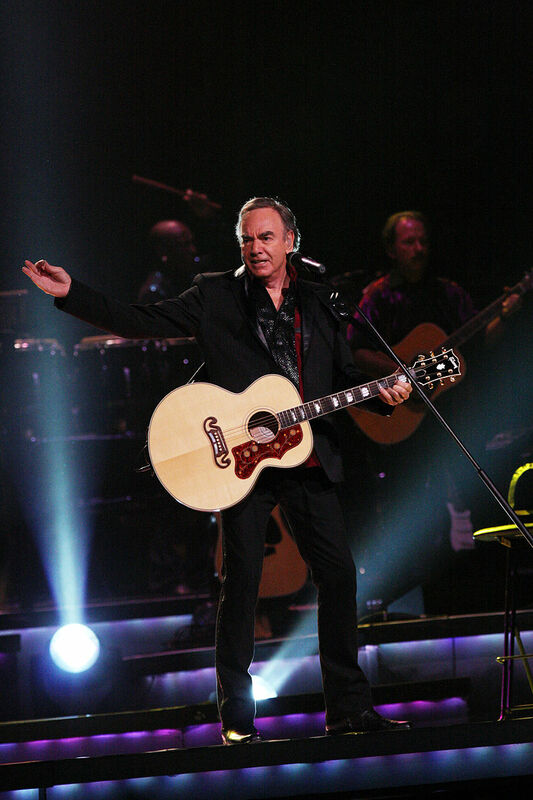 As the new millennium rolled around, Neil Diamond, the interpretive vocalist, returned to the movies as the inspiration for "The Movie Album -- As Time Goes By", a two-disc collection of 20 classic songs from the treasure trove of motion picture music. True to the spirit and magic of Hollywood at its best, "The Movie Album -- As Time Goes By" was recorded live on 20th Century Fox's Newman Scoring Stage and conducted by the legendary film composer/conductor Elmer Bernstein. But the eminent singer-songwriter is quick to note that his own songwriting days are far from over. "I'm writing new material all the time," says Diamond, "but I look forward to just going out and singing the songs from "The Movie Album -- As Time Goes By", without worrying how the audience will respond to new material, because all these songs are wonderful going in. Neil announced that he had been diagnosed with Parkinsons disease in January 2018, and retired from performing live. However, he stated that he would contunie to be active and write/record new music.